Water damage is typically caused by a type of plumbing failure or severe storm which is everyone’s worst nightmare! The ultimate protection against catastrophic water damage due to a plumbing failure is remembering to shut off the main valve that supplies all the water for your home. In case of an emergency, everyone in your residence should have knowledge of where to locate the main water shutoff valve, enabling them to stop the water. Remembering to turn off the water valve whenever leaving home, even overnight is important as well. If you’re uncertain of the water valve location, locate your water meter; nearby your main shutoff can be found. Severe storms or torrential downpours can lead to flooding and rain leaks. Both activities leave head ache and disaster behind. Damage from flooding can be caused from only a few inches of water and are typically found in basements. While rain leaks are noticed near or around skylights, bow windows, brick walls, or rain gutters. Common household issues that are lead causes of water damage include: overflowing toilets, bursting pipes, plumbing leaks, and ruptured hoses. Overflowing toilets can be caused by improper disposal of sanitary products, overuse of toilet paper, or a mechanical malfunction inside the tank of the household toilet. Bursting pipes are typically due to a freezing issue. The issue occurs due to an ice blockage and the faucet that is closed at the end. Although pipe bursts occur where there is little to no ice found, the problem is due to thousands of pounds of water pressure. A solution of insulating the whole space may be a savior to bursting pipes. When it comes to noticing plumbing leaks, it’s vital for the homeowner to do common pipe checks. It’s understandable to view the pipes of your basement without having any knowledge of what you’re seeing, however if rust is spotted, hints of buckling or water drops, you’ll realize something’s wrong. The hidden ruptured hoses, also known as, “frost proof” water faucets, freeze and split internally when hoses are left attached over the winter season. A wise purchase is a female cap with a rubber hose washer inside that threads onto any faucet bib. This will save you a lot of hassle. Slightly turn on the faucet and listen carefully after placing the cap on the hose bib. If you’re able to feel or hear running water, this indicates that the faucet has an internal rupture inside of the wall and must be shut off immediately. Ensure that the water source is shut off. Ensure the breaker is turned off in the damaged area prior to unplugging or removing electrical devices found on the wet carpet. Place aluminum foil under furniture legs that are in contact with wet carpet. This may prevent furniture stains on the carpet. Using your home vacuum – electrical shock may result as well as damage to the vacuum itself. Placing newspaper in traffic areas to walk on, newspaper ink transfers quickly to wet carpet fibers and could result in staining. Walking on carpet unless it’s necessary. This will prevent damage from spreading to areas that aren’t affected. When considering ways to clean and tackle your water damage, consider that water always works its way up walls and travels underneath base molding and sill plates. 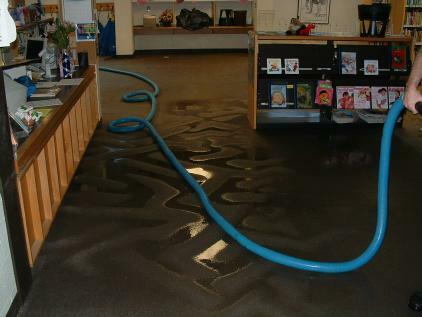 Water will penetrate its way through floor coverings into sub-floors, causing more damage to rooms below. These are details many homeowners neglect to consider before choosing to attempt shop vacuums or call companies that are only equipped to dry carpet. It’s also crucial to remember that if humidity is left uncontrolled inside the structure, damage due to mold growth could be done to items that weren’t harmed in the original flood damage. Fort Worth Flooding – What Can You Do to Protect Your Home?